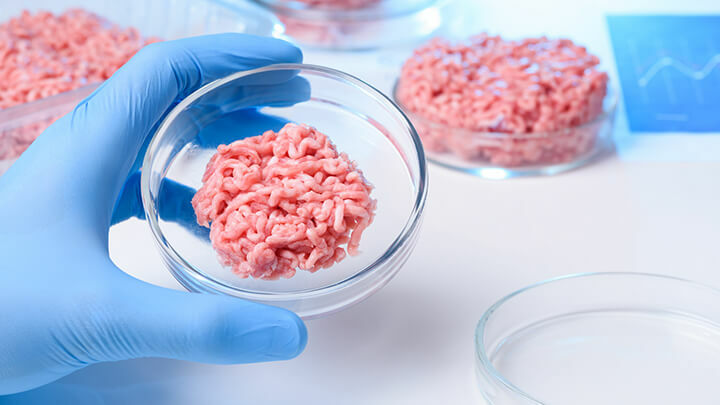 For the first time ever, a genetically modified animal is available for consumption, but most people are blissfully unaware of the serious health and environmental consequences of this. Last month, AquaBounty Technologies in Maynard, Massachusetts sold five tons of genetically modified salmon fillets to a client in Canada. The Alternative Daily talked to Jaydee Hanson, the Senior Policy Analyst at the Center for Food Safety, which is suing the FDA over its approval of the GM salmon for consumption in the US. Pending the resolution of this case, the salmon could also be available in the states soon. Hanson warned the fish could have high levels of cancer-causing hormones, while Patty Lovera, the assistant director of Food & Water Watch, told us that the fish could also have different protein levels.AquaBounty did not respond to an email interview request from The Alternative Daily, nor to numerous phone calls. The GM salmon grow roughly twice as fast as farmed Atlantic salmon, and the company claims the salmon consume 20 to 25 percent less food per gram. This is due to a growth hormone taken from Chinook salmon and from an eel-like fish, Ocean Pout. However, Food and Water Watch alleged that the growth rate claims are exaggerated. The fish are sterile and being raised in indoor, landlocked tanks, meaning there is little danger of cross-fertilization with other fish, according to AquaBounty. But, Food and Water Watch sees things differently, noting that five percent of the fish will, in fact, be sterile, according to the company’s own regulatory submissions. GE salmon contains year-round growth hormones, which could be dangerous for your health. GM salmon could potentially cause more allergies than regular salmon, Hanson explained, though we can’t be sure, due to a lack of proper studies. AquaBounty “botched” its test for allergic reactions and “The FDA, for reasons I don’t understand, didn’t make them redo it,” said Hanson. “They did another test that was really small, on just six fertile fish and six regular fish. They found the fertile genetically engineered fish were so likely to cause allergic reactions that the FDA said, ‘We’re not going to let you sell fertile fish,’” Hanson said, stressing how small a sample size six fish is. He added that in his conversations with AquaBounty, the company stated it wasn’t going to test for human reactions, as the FDA didn’t require it. “The other thing is these fish are engineered to have way more growth hormones than normal… And we know, from the growth hormones that are put in beef, that they can create a hormone called IGF, which increases insulin formation,” Hanson said. Higher levels of IGF lead to higher levels of cancer. While many meat animals are put onto hormones, they are also taken off them. The FDA requires a waiting time between taking the animals off hormones and feeding them to humans. The salmon, on the other hand, have the hormones built “into every single cell” and they can’t be turned off. Finally, the genetically modified fish have fewer omega-3s. Hanson explained that omega-6 fatty acids cause inflammation, while omega-3s reduce it, “so you want a fish that has the most omega-3s possible,” said Hanson. “The ratio of 3s to 6s in this AquaBounty fish is the worst of any farm fish, and this is in AquaBounty’s own data. They compared the levels to normal farm fish and wild salmon. Wild salmon is always the best because they eat shrimp and other high-energy foods, but AquaBounty is feeding these salmon soy, because it’s cheap,” said Hanson, while noting that the AquaBounty omega-3 levels were only 10 percent lower than farmed salmon. The FDA approved the AquaBounty salmon in 2015 — the first genetically modified animals approved for human consumption. However, just a few weeks later, the FDA banned the import and sale of the fish until labeling guidelines were set up. In March 2016, the Center for Food Safety and a coalition of environmental groups filed a lawsuit against the FDA for its approval of the salmon, arguing the FDA had bent outdated policies on “animal drugs” to get it through. They argue the approval sets a precedent for allowing other genetically modified animals into supermarkets. Currently, the FDA regulates genetically engineered animals as though they were veterinary drugs. “This isn’t what was meant by an animal drug. It’s actually a whole new animal, the animal itself becomes the drug,” Hanson said. In the US, some companies like Costco and Red Lobster have stated they won’t be selling GMO salmon. See here for the Center for Food Safety’s full list of supermarkets that have pledged to avoid GE Salmon. Hanson was adamant that there is no way to look at a piece of salmon and know if it is genetically modified. “(AquaBounty) is selling its (salmon) eggs to growers in Brazil, Argentina and Chile, so we might end up importing their salmon without knowing that it’s genetically engineered. My advice would be if you see salmon from these countries, assume its GE,” Hanson said. Otherwise, it’s easy for groups like the Center for Food Safety, or the stores and supermarkets selling fish to test if the fish being sold has DNA that has been genetically engineered. However, though DNA testing is getting cheaper and cheaper, it’s not the sort of thing consumers can do on a quick trip to the supermarket. The only recourse consumers have is to pressure the FDA to enforce labeling, or pressure stores to not sell GM food. According to Living Non-GMO, AquaBounty grows its fish eggs on Canada’s Prince Edward Island and raises the fish in Panama. The company has received various fines in Panama for environmental violations, after experimenting with genetic engineering salmon there. In one case, a storm-related incident saw salmon get “lost” in Panama, Food and Water Watch stated. Even if the risk of escaped fish is low, should that happen, it would be “impossible to contain them” Friends of the Earth argued. But Hanson stressed that the real worry was the fish eggs. “We have reason to think that people at AquaBounty have taken out fish eggs and grown them out in their own ponds,” he said. Hanson grew up in a family of many fish breeders, and one of his uncles ran the state fishery. He said that people were always taking the eggs out of it – that such behavior is common. Once the eggs hatch, new populations of the GM salmon can be established outside AquaBounty’s tanks. Hanson also argued that AquaBounty’s operations are just 100 feet from the sand, and that if they were to be hit by a hurricane — unlikely, but not impossible — those tanks could burst and the fish would be washed down to the sand. The GM salmon are like “hungry teenagers,” Hanson said. Their hormones are on all the time, instead of twice a year, so they are eating and looking to mate all the time. Ultimately, that makes it easy for the GM salmon to eventually replace the endangered Atlantic salmon, as the GM salmon eats its food, and sterile females mating with male Atlantic salmon stop it from mating again for six months. But it gets worse. 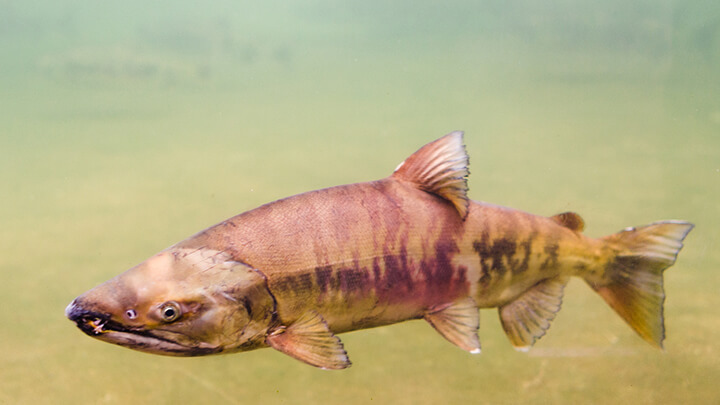 Lovera noted that beyond disrupting the ecosystem, the GM salmon can conflict with people who have religious or ethical concerns about using genetic engineering techniques on animals. “Fishing communities on the west coast and in Alaska are also very opposed to GM salmon, and farmed salmon in general, because of the damage they could cause in the wild salmon fisheries that they depend on for their livelihood,” Lovera said. 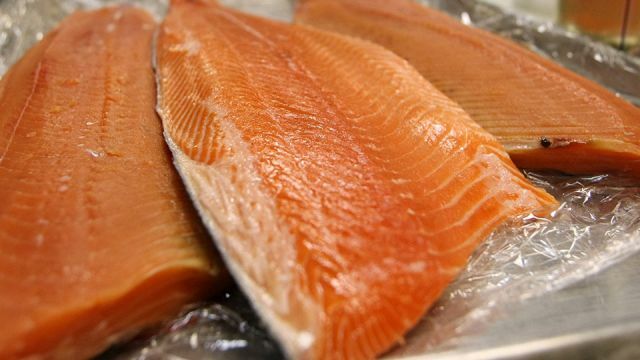 If the FDA approves GE salmon, it paves the way for other GE meats. Ultimately, this isn’t just about salmon. If the FDA lets the salmon be sold in the US without a label, that sets a precedent that paves the way for other GE animals to be sold. Some 30 other species of GM fish are currently being developed, as are GM cows, chicken and pigs, according to The Guardian. For example, the FDA is considering the Enviropig TM, an enhanced Yorkshire pig which can digest plant phosphorus more efficiently than regular pigs. Stopping the sale of GM salmon is about stopping the sale of genetically modified fish and animal meat. Hey Buddy!, I found this information for you: "Investigative Report: Are You Eating Genetically Modified Salmon? Here’s How To Know". Here is the website link: https://www.thealternativedaily.com/how-to-know-if-you-are-eating-genetically-modified-salmon. Thank you.